In the eight years between 2009 and 2016 Ireland spent €428.1 million on free criminal legal aid, while in February 2015 Fair Trials International found that in Ireland 71% of suspects and accused persons are entitled to legal aid. 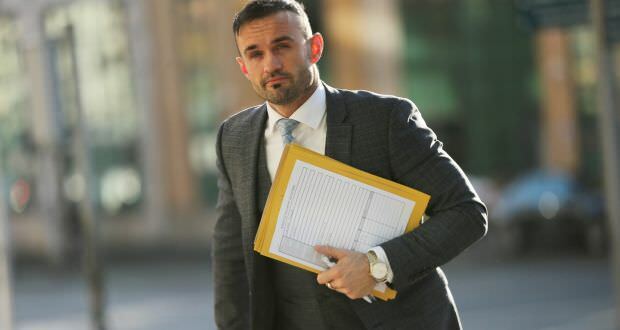 Aonghus McCarthy (32), who claimed someone else put the drugs in his wallet at a party, was told he would get a strike out if he donated €1,250 to a drug addiction treatment centre. Judge Gerry Jones said Mr McCarthy, with an address at Wellington House, Clancy Quay, Dublin 8, was in a “noble profession” but was being treated the same as any other defendant. …uring the interview he said that, “I absolutely 100 per cent did not put it in my wallet” and claimed “someone else must have put it in there”. He said it was possibly someone he had gone to a party with, the court was told. “I do not do drugs and I would not risk the entirety of my career. I don’t know who did do it and will ask around,” he said. The judge said he would strike out the case and leave Mr McCarthy without a conviction if he donated €1,250 to the Merchant Quay drug project. “He will get one chance and one chance only,” the judge added. Apologies for the link via pressreader but I cannot find this anywhere else…quelle surprise! Speaking in Dublin on Wednesday, Mr Schrems noted the Office of the Data Protection Commissioner (DPC) had run up a bill of €2 million in pursuing his case against Facebook. Mr Schrems said lawyers had also told him that companies can be unwilling to appeal DPA decisions due to the legal cost. A solicitor who paid himself what an independent solicitor described as “extortionate” fees of €344,000 out of a child’s €454,840 estate has reimbursed that sum, the High Court has heard. The €344,000 has been lodged in an account controlled by another independent solicitor pending further court order. In addition to paying over the €344,000, Declan O’Callaghan, practising from Pound Street, Ballaghderreen, Co Roscommon, has made proposals to the Law Society aimed at allowing him continue to practice under supervision of another solicitor, the president of the High Court was told on Friday. The regulation of practice (RTP) committee of the Society will hear details of the proposals next week to decide if they are adequate or whether the Society should proceed with its application to suspend the solicitor from practice pending a hearing before the Solicitors Disciplinary Tribunal (SDT). The independent solicitor expressed the opinion the fees charged bore no relation to the work done on behalf of the estate to date and described them as “extortionate”. Mr Justice Kelly said Mr O’Callaghan had in affidavits pointed out the report also said positive things said about him regarding his level of expertise and the work he did for the estate. In the affidavits, the soicitor said he had conducted himself honestly at all times. He also said he must now accept the independent solicitor’s opinion the fees charged were “excessive”. The judge said suspension would have a detrimental effect, not just on the solicitor but would also jeopardise nine staff employed at the practice “who were not responsible at all for this unfortunate business”. **If a method of protection of the public could be found other than suspension, the court was open to that being explored but that was a matter for the ROP committee to decide in the first instance. The administrator of the child’s estate was represented and was happy to continue in that role and do whatever was in the child’s best interests, which might include consideration of making him a ward of court, he also noted. Another report will try to rein in the compo carnival but judges do not take instruction, even from a retired President of the High Court. The comparison with France and Germany is embarrassing. When will our continental cousins wake up to the free money which we call Whiplash? The legal profession in this country are practically untouchable! In fairness to Alan Shatter , he did try to reign them in but the legal eagles and their buddies in the political parties and the press shafted him out of office before any damage could be done! Such outstanding work deserves a retrospective review of similar cases, say ten years at least. What is planned? A solicitor who paid himself what an independent solicitor described as “extortionate” fees of €344,000 out of a child’s €454,840 estate has reimbursed that sum, the High Court has heard… The regulation of practice (RTP) committee of the Society will hear details of the proposals next week to decide if they are adequate or whether the Society should proceed with its application to suspend the solicitor from practice pending a hearing before the Solicitors Disciplinary Tribunal (SDT). He took over a quarter of another estate in fees, claiming he had authorisation to do so when he didn’t, and again with a big chunk of fees “in anticipation” of litigation that didn’t actually take place. The widow involved only got suspicious when she heard through the media that yer man was being investigated in the other case. ** EDIT: ok, looks like I was ridiculously naive. Judge Kelly didn’t strike off another solicitor and allowed her to continue to practice under supervision after a finding of professional misconduct against her for “causing a deficit” of €259,000 on a client account. (Interesting term for transferring money without authorisation). Another fine upstanding gentleman of the legal profession caught bilking his client to the tune of €650k. The Irish fondness for secrecy helps the lawyers. We need more people to come forward and show what they paid and exactly what services they got for that money. The Irish Times has established that in the early 1990s, an audit of Declan O’Callaghan’s affairs, carried out by Jim O’Dowd, a chartered accountant and investigator who works for the Law Society, prompted the society to take action. According to sources familiar with events, O’Dowd found that O’Callaghan had obtained credit under false pretences – by obtaining, from three separate lending institutions, three mortgages, amounting collectively to some IR£100,000, and all on a single undertaking. There was also evidence of numerous other breaches to Law Society rules regarding client accounts. The ledger account (the written record of client monies held) did not match what was in the bank. The Law Society disciplinary body held an inquiry and, in lieu of striking O’Callaghan off the solicitors’ registry (known as the roll), recommended to Mr Justice Liam Hamilton, then president of the High Court, that he be curtailed professionally. …On Monday, May 8th, Roscommon Racecourse played host to the Kilrane O’Callaghan & Company Solicitors Handicap – seven horses chasing a total purse of €12,000. The winning horse was named Bottle of Smoke. But around this time, the Law Society took a look inside Kilrane O’Callaghan and Jim O’Dowd (the same forensic accountant who examined O’Callaghan some two decades previously) didn’t like what he saw. So the same accountant came back more than twenty years later to find, well, more of the same. He would be forgiven for wondering if he were a character in The Third Policeman or Groundhog Day. By contrast, my experiences with Canadian lawyers so far have been uniformly positive - timely and cheaper than expected. Even a supposedly dodgy one gave me no trouble. In addition, a request to administer an estate was dealt with by a judge here in less than a week from the time we sent in the paperwork. He hates delays. So far, so fair enough. In Ireland, the “family home” is the most sacred of sacred cows, after all. But there was more. “In practice, the PIP will also have to assess the type of house that might be needed for a professional person such as a solicitor, accountant or a hospital consultant, as opposed to a house that’s needed by someone who is in the PAYE sector for example,” Jim explained helpfully. Why is that beak not being done for theft? If I rob a bank, get caught and give the moeny back can I get a slap on the wrist too? You are forgetting the societal pecking order. In the special unwritten rules for solicitors it’s not theft if you felt you were entitled to it. A solicitor took a €246,000 fee with no proper paper trail from a woman whom she had represented in two medical negligence cases, it was alleged yesterday. William Waters, the son of Ann Waters, who died aged 50 in 2014, has taken his case against lawyer Maura Derivan to the Solicitors Disciplinary Tribunal. At a hearing yesterday, Mr Waters, from Carrick-On-Suir, Co Tipperary, questioned the validity of documents in the case and his mother’s signature on them. Ms Waters received a €2.2m payout in January 2012 as settlement for two medical negligence cases in which she was represented by Ms Derivan, who denies the allegations against her. Her senior counsel, Jack Fitzgerald, told the tribunal that she would be giving evidence to support her case. Mr Fitzgerald produced a hand-written “solicitor and client agreement” which he said was created on the day Ms Waters settled the negligence cases in January 2012 and signed by her that March. It showed Ms Waters had agreed to fees of €200,000 plus VAT, to cover the historical case and opinion work done for her, he said. Mr Waters, who has no legal representation in the case, said that he had no previous knowledge of the document and said it “could have been jotted down yesterday”. He questioned the validity of his mother’s signature on it. Mr Williams also questioned what happened to a sum of €578,500, which was given to his mother in 61 cheques for sums ranging from €5,000 to €45,000 after the settlement. A tribunal has recommended a solicitor be struck off after a Law Society investigation found she diverted €266,000 of client funds into her personal bank accounts. The siphoned-off cash included sums left in a will to charity and a priest. The Solicitors Disciplinary Tribunal heard Donegal solicitor Moya O’Donnell misappropriated and misused client funds between 2012 and 2017 and produced falsified documentation in an attempt to conceal her actions. These included a letter purporting to be from the Revenue Commissioners, and a false record of an electronic fund transfer payment. Her husband, also a solicitor, committed suicide on this day last year when he found out the extent of it.